Well. Last week was quiet but this week is busy. I got inspired at the end of last week and am madly trying to get things in order before I get operated on next week. So you and I are doing some mad organising. Still haven’t managed to move the stuff around the house into the new wardrobes, so the goal this week is to get that done so when your Aunt R arrives back in Australia next week (hooray – you’ll like her I’m sure), she has somewhere to sleep at our house so she can stay and help. At the moment there is nowhere for her as your Dad’s office is taking up one room and you take up another. You’re moving into your Dad’s home office for a bit so that she has somewhere to sleep! What have you and I been up to apart from madly organising things? Well, we’re still doing our mummies and babies get togethers. Monday is coffee shop day with the women and babes that we were in the local health area classes with. 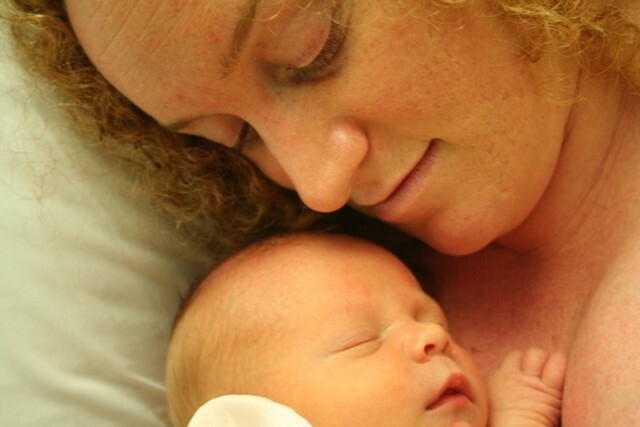 Then Tuesdays we go to the hospital for post-natal exercise with C & baby Hamish. And the other mums. And then Wednesday this week we are catching up with the mums from antenatal classes. That’s a new thing. And then Thursday this week is our fortnightly catch-up with the local yoga-baby mums and babes. Which we’ve been doing for a couple of months now. Very enjoyable. So. Apologies for not having taken you to the State Library for the Rhymes and Reading session on a Thursday yet, but now its going to have to wait until I’m able to walk again. Let’s say January! Righto. So. The weekend was quiet. It was still very dusty. We had a massive dust-storm come through last week. Wednesday. It was absolutely amazing. Like nothing I’ve ever seen in my lifetime. Apparently it was a one in 70-year event. Lets hope so. Red dust filled the sky and the fine silky red dirt permeated every crack and crevice of the house, the furniture, everything. We stayed indoors and closed all the doors and windows. You couldn’t see 100m – the houses on the next ridge were only just visible as an outline. Apparently lots of people got sick from inhaling it – joggers particularly (though I have to say – STUPID. Who runs when the dust is so thick in the air you can’t see 100m???). A smaller dust storm came through again on Saturday night. 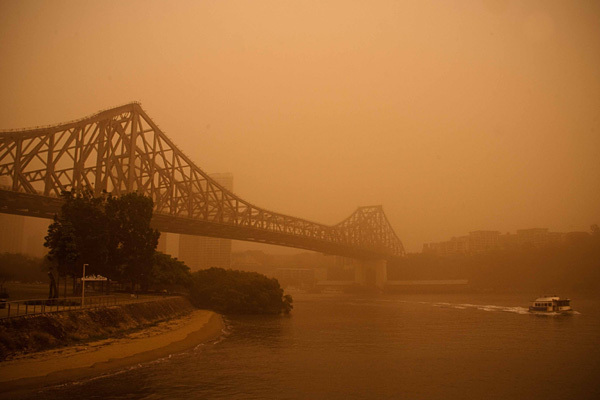 Apparently the dust blew all the way from the western desert area of NSW, right over to Sydney, then up the coast to Brisbane. 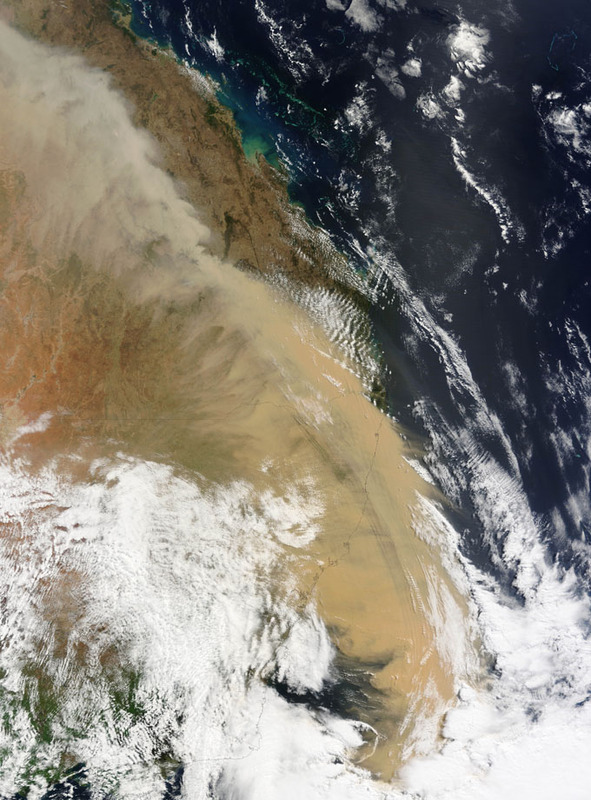 A day later there was dust falling in New Zealand – it blew right across the Tasman. Climate change. After being cooped up on Saturday night we took you for a big walk on Sunday. From our house, down to Southbank to the kid’s water park. Its fun just to sit there and watch all the kids run around with glee. Hundreds of kids, lots of water. Lots of fun. I think when you get older you’ll like that we live close to it. Lots of kids have to travel from a long way around to get to it. Anyway, we sat with you and you watched the other kids cavorting around, screaming and laughing as they ran in and out of the water jets. You got as far as dipping your feet in. Well, I dipped your feet in. You thought it was a bit cold, from the look on your face. But didn’t scream or cry. It was more of an, “mmm. that’s cold. I wonder why my mum is doing this to me? Maybe there is something in this that I’m not getting” kinda look. You at the waterpark. 14 weeks old? so. Life is busy busy busy. And you are growing like nothing I’ve ever seen before. At last check you were 6.3kg. I think. Next check today. I’m thinking you might have nearly doubled in size since you were born.